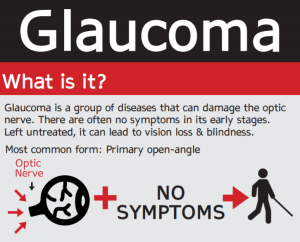 January is National Glaucoma Awareness Month, an opportunity to increase consciousness of this cluster of diseases that steals sight with few to no symptoms. More than 3 million Americans currently suffer from glaucoma, and the National Eye Institute predicts a 58% increase in glaucoma patients by 2030. Prevention is the number weapon in the fight against glaucoma, as there are no physical symptoms, and patients can unwittingly lose up to 40% of their sight, permanently, before the disease is identified. Currently, there is no cure for glaucoma, so caregivers, loved ones and home care aides all need to be aware of the potential for impaired sight to stop glaucoma in its tracks. Glaucoma is the foremost cause of preventable blindness, comprising 9% to 12% of all American cases of total blindness. Glaucoma strikes African Americans and Latinos more often than Caucasians, and it’s possible that half of those who currently have glaucoma don’t even know they have it. As the U.S. population ages, a sweeping increase of sight impairment and blindness looms, making regular eye exams for the senior cohort crucial. The sad truth is that even when glaucoma is detected, and treatment begins, ten percent of patients still lose their vision. Glaucoma comes in many forms, most of which involve a breakdown in the way the drainage system in the eye performs. A small space at the front of the eye is called the anterior chamber, through which clear fluid flows, cleansing and nourishing the tissues around it. Glaucoma causes this fluid to drain too slowly, which causes the pressure inside the eye to grow. This pressure damages the optic nerve and other critical parts of the eye, causing loss of vision. The most common form of glaucoma, called open-angle glaucoma, refers to the part of the drainage system where the fluid backs up, the open angle where the cornea and iris meet. (This video from the National Institutes of Health shows you how glaucoma acts in the eye.) The causes of this sluggish drainage are still not known, which means that while there is a treatment for glaucoma, there is, as yet, no cure. Even worse, vision lost to glaucoma cannot be restored. There is no cure (yet) for glaucoma: With medication and/or surgery, it is possible to halt further loss of vision. Since open-angle glaucoma is a chronic condition, it must be monitored for life. Diagnosis is the first step to preserving your vision. Everyone is at risk for glaucoma: Glaucoma can strike at any age, and while older people are at a higher risk, babies can be born with glaucoma, too. 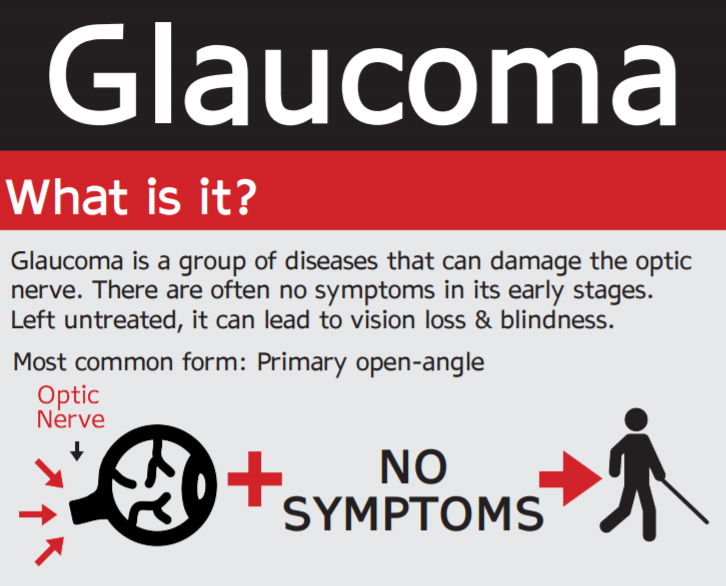 There may be no symptoms to warn you: With open-angle glaucoma, the most common form, there are virtually no symptoms. Usually, no pain is associated with increased eye pressure. Vision loss begins with peripheral or side vision. You may compensate for this unconsciously by turning your head to the side, and may not notice anything until significant vision is lost. The best way to protect your sight from glaucoma is to get tested. If you have glaucoma, treatment can begin immediately. The most important weapon against glaucoma for loved ones of any age is prevention, which requires regular eye exams, preferably by an eye doctor (opthamologist or optometrist) who will dilate the pupils. Too often, caregivers and loved ones react to pain or impairment when seeking medical care, but prevention is the only way to thwart glaucoma and preserve the precious gift of sight.